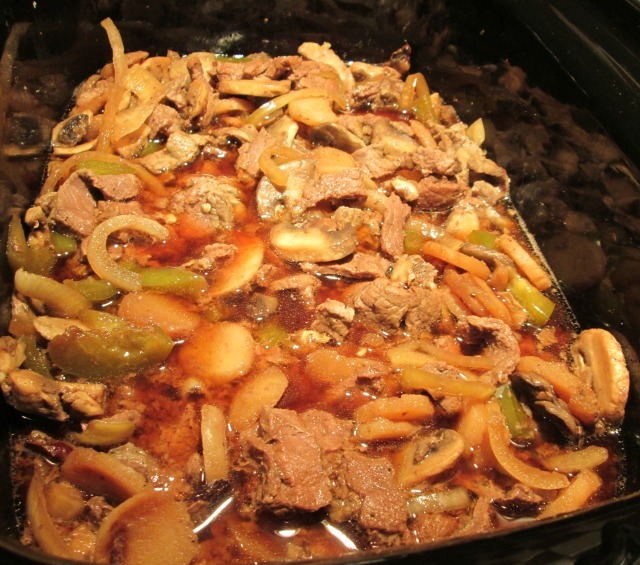 Slow Cooker Beef "Stir Fry"
Please be advised that this post makes use of affiliate links. By clicking on a link and making a purchase, I will receive a small commission. We love making stir fry in our house because it’s so easy to put together. Most of the time we have the ingredients we need on hand, so it’s only a matter of making a quick stop to the grocery store to pick up the main ingredient. Usually we make beef stir fry, but we’ll also make chicken stir fry. The other night, however, Kyle and I were debating as to how we should make our stir fry. Since we don’t have a wok, we usually just use a saute pan. We both have fond memories of our parents making stir fry for dinner and though their methods (and maybe even some ingredients) were different, the tasty memories were the same. Last night, we decided to try making our stir fry in the slow cooker. I know, slow cooker beef stir fry doesn’t quite make sense but trust me- the end results were just as delicious and I felt that the taste was more pure since we didn’t fry anything. Your ingredient list might be different from ours, which is to be expected I think. If you do try this at home, don’t feel pressured to use the exact same ingredients. We’re just going on personal preference. 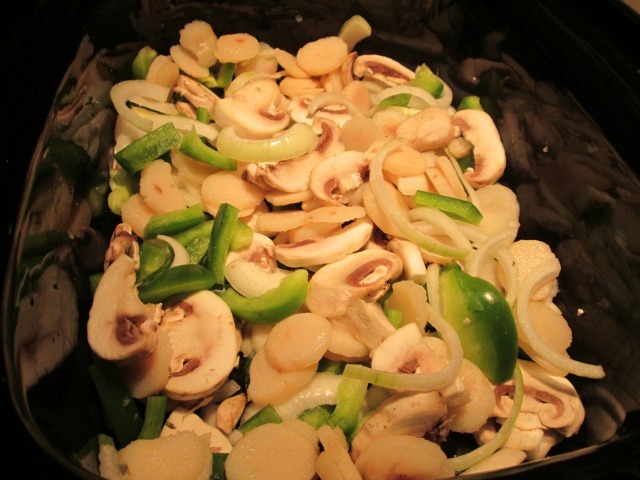 The main vegetables that we use in our stir fry are pepper, mushrooms, and onion. Sometimes we’ll buy the frozen mix when we’re hard pressed for time and just want to really throw something together. Of course you an also use red or yellow pepper in addition to or in place of the green pepper. I tend to find that yellow and red peppers are a bit on the sweeter side. 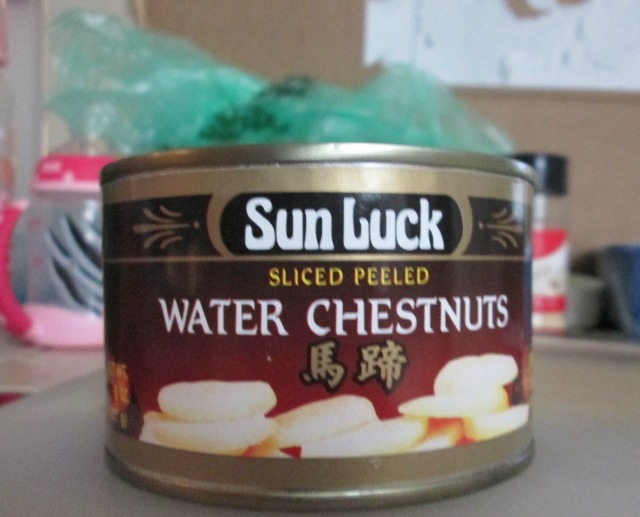 Our stir fry recipe wouldn’t be complete without water chestnuts. A favorite of both mine and Kyle, these always add a little bit of crunch to the recipe. 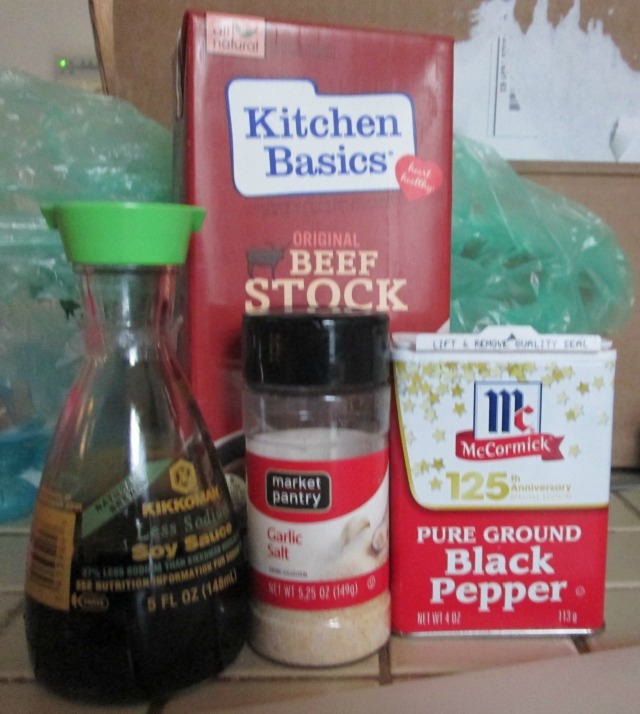 Other ingredients you could include are: bok choy, snap peas, baby corn, and bamboo shoots. While we haven’t included those in any of ours yet, I always remember my mom putting in bok choy and bamboo shoots. We left both the mushrooms and the water chestnuts whole. 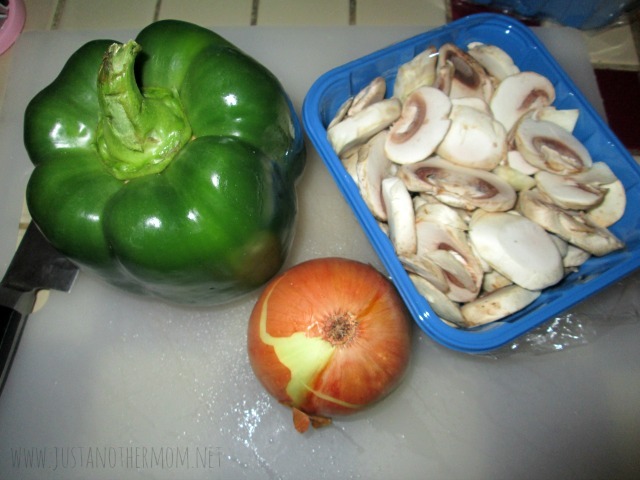 The onion was halved and then sliced while the green pepper was cut into thirds. Really this your choice as to how you cut your vegetables. Sometimes we’ll buy stir fry beef (which is just the beef cut into strips) and other times we’ll buy thinly cut pieces like these. 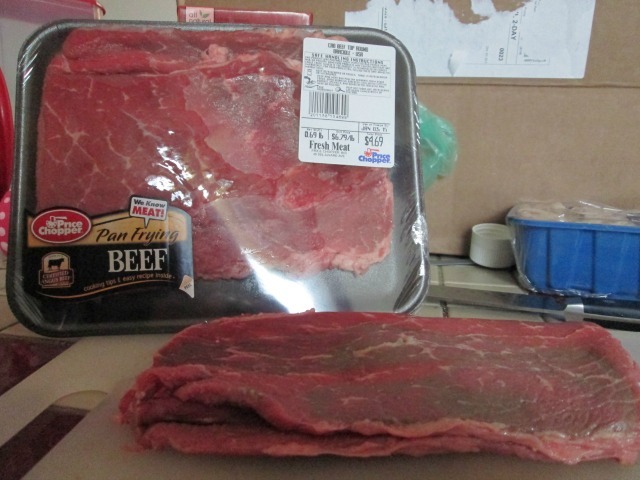 I believe these are the ones used for Braciole, so they’re on the thin side. Perfect for a stir fry as well. For this, we cut into strips and then each strip was cut into thirds. After everything has been added into the slow cooker, we season it all together. Though we didn’t have quite as much soy sauce as I would have liked (usually we use 1/2 a bottle), the end result was still pretty tasty. We also used 1 1/2 cups of beef broth, though next time I think we’ll cut that down to 1 cup. Pepper and garlic salt are purely to taste though I think I ended up using about 2 teaspoons each. Once everything is seasoned, cover and set on high for 3 1/2 hours. Or you can set on low for 6 hours, whichever you prefer. Optional step: during the last half hour of your stir fry cooking, prepare rice. We’re going to invest in a good rice cooker eventually, but until then we make ours on the stove top. And if you want a foolproof preparation method, here’s how I do it: Pour rice into your pan, place your hand in the pan so that your palm is flat on the bottom of the pan. Yes, that does mean moving the rice around. Cover with cold water until you reach your wrist. Cover the pan with a lid and put on the stove on medium to high heat. Watch the pot occasionally but DO NOT STIR. 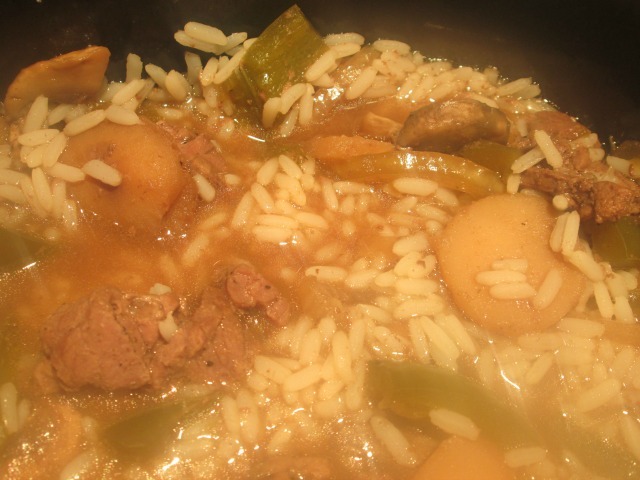 Once the rice starts to bubble, let it bubble for about five minutes before lowering heat to low-medium. Let simmer at this heat until done, approximately another ten minutes. If you still have water on the bottom of your pan, let simmer on low until the water is gone. We added the finished rice into the slow cooker, next time we’ll try cooking the rice with the stir fry and see how it goes. This looks great! 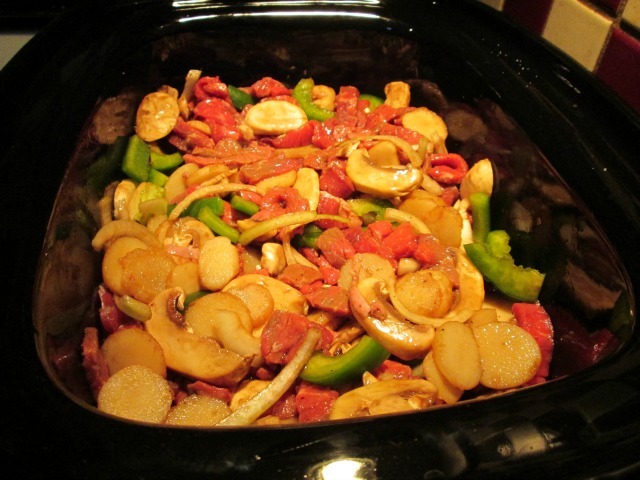 I have been looking for more slow cooker recipes going into the new year! Need to make this in my Instant Pot! Love the all-in-one-meals! This looks very tasty, thanks for sharing it. Who would have thought that you could do “stir fry” in a slow cooker. Looks good Kori. We love our rice cooker and use it mostly for brown rice. some oil and it taste great! I can’t wait to try this recipe…thanks for posting it! I’m always looking for new Slow-Cooker recipes and this one looks like a winner! 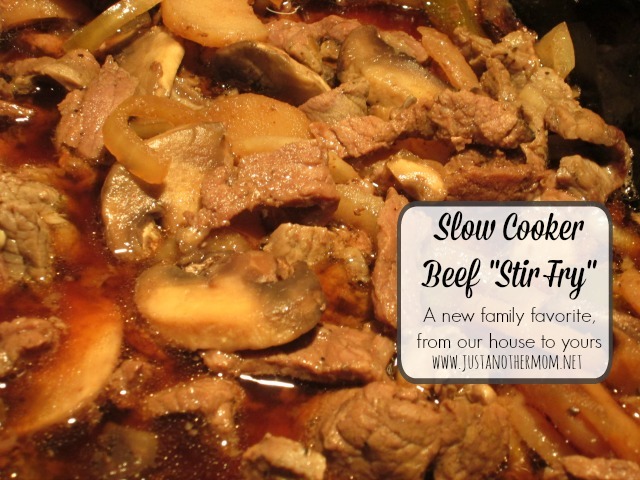 We use our slow cooker quite often but never thought of making a stir fry. This looks so good and will make it soon. Thanks for the recipe. Ohh this looks tasty! Can’t wait to give it a try! It is! We love making this.